So last night I was at a team roping and didn’t get in until 4am. I slept until I had to get up and move goats due to more rain. Then I spent some time with Mom as she made a wedding gift for a Couple who got married tonight. It was the first wedding I have attended. However, Everyone was told that we needed to be evacuated due to the rain and flooding which had the bride in tears. So last night I was out at a team roping until 4am. 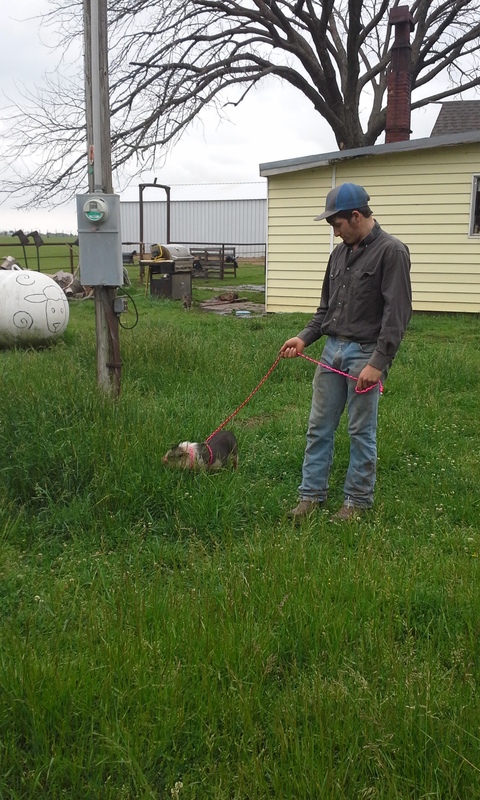 I took Storm and it was her first roping back since she twisted her leg about 8 weeks ago. We placed 6th and it brought home a paycheck. Not bad for the first time competing in that long. She did great and she nailed everything I asked her to do. And she did it without shoes on. Thursday she is supposed to get her shoes back on. Then just imagine what she will do. Today it was more rain. And lots of it. At 10am Mom came in and got me up to help move the goats again. Their pen is flooding the worst but we just move them into the barn and then back when the pen drains. It rained off and on all day. It made it hard to get the goats anywhere. They just keep having to go in the barn when it floods … In between dealing with all the rain and flooding, I hung out with Mom. I made us Tacos for lunch while Mom made a Baking pan carrier for a friend of hers that was getting Married tonight. We left for the Wedding, that took place at Woolaroc. It is an awesome place. It is the country home of Frank Phillips … The founder of Phillips 66 Petroleum Company way back when. After the Ceremony, the couple was starting the reception after a lot of Picture taking when a worker came in and said that Everything needed to be evacuated and it needed to happen within the hour. The Bride got upset. I kind of think that they handled the whole issue very badly. I think the worker should have pulled the Groom aside and explained the situation to him and let him handle it. After the lady came and said that over half the people got up and left. Leaving the Couple not yet having a first dance, a Daddy Daughter Dance or even cutting the cake. I can see why the Bride was upset. As for Mom and us. We stayed. We were there for them from Start to finish. Mom even helped the Bride’s Mom clear food from the reception and get things cleaned up so that they could at least have their “moments” before we had to leave. Then as we went to head out The Bride’s Brother’s car wouldn’t start. The Groom was out in the rain trying to jump start it with his Little Hybrid. Mom told him to move his car and she would handle the jump start. That hybrid just didn’t have a battery big enough to jump anything. Mom’s truck on the other hand … She had him give it a few moments and then it Cranked right over. As we left the employees where showing everyone the way out of the Event the back way. And sadly, the back way wasn’t flooded. I am not sure why they didn’t just take everyone out that way AFTER the reception instead of upsetting the bride and scaring the guests half to death. It was kind of Crazy but It was a beautiful wedding. The Bride and Groom are amazing people and they are well on their way to a happy life together. So today I was dragging and so was Mom. You see we have a routine. And every time we get things going and on Schedule something seems to come along and shake things up. Most of the time we can fit what ever it is into our routine withing a week or so and get our lives back on track. And it stays that way until the next something comes along. The something this time Is a Buttercup. Mom is hoping that Buttercup will blend in to our Dog Schedule. By that I mean When the Dogs are let out she wants Buttercup to go do her Daily Duties outside as well. We give the Dogs plenty of time outside and they pretty much come and go as they want. Getting Buttercup to go out though has turned out to be a HUGE undertaking. You see she won’t just walk out the door to the back yard. She came to us with a halter. So Mom had been taking on the task of wrestling a VERY, VERY loud Squealing pig to get her into the halter. It doesn’t really work and Buttercup can slip her front legs out of the halter. Mom isn’t impressed and honestly I thought Mom was exaggerating a bit. Until I tried to halter her and she nipped at me. If she had her way Buttercup would have me called stubby. So Mom took to carrying Buttercup outside several times a day. 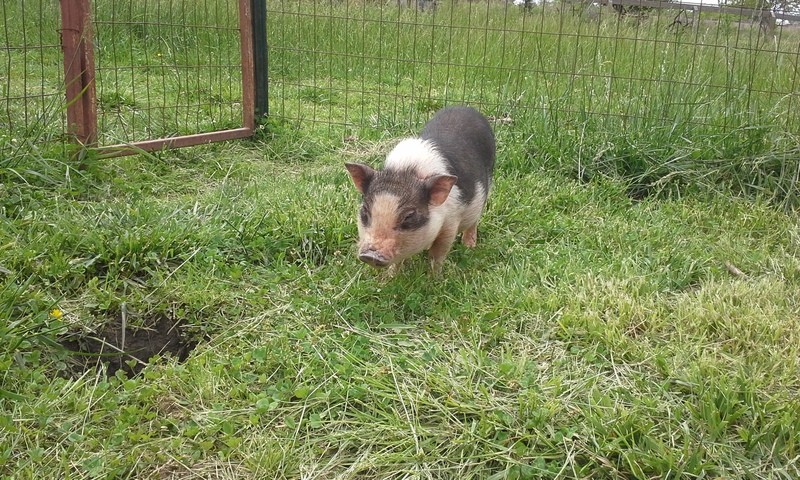 However, having a VERY, VERY loud squealing pig that close to your ears isn’t so impressive either. As a matter of fact it is actually worse then the physical wrestling. 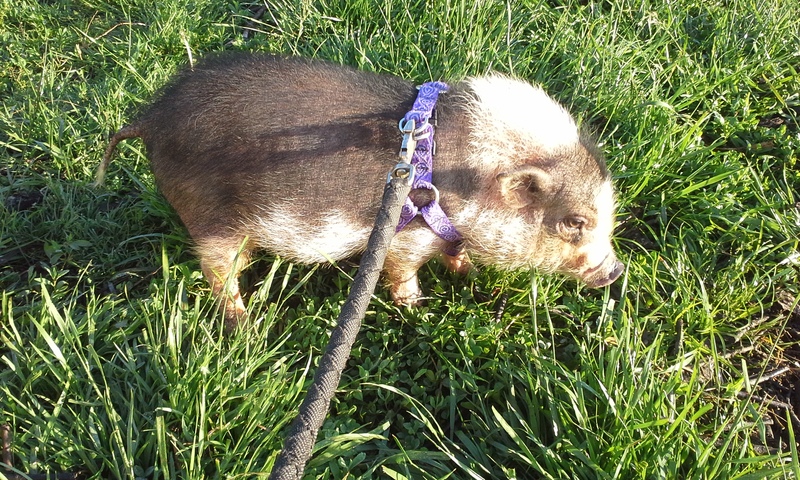 To make it all that much worse is that not only does she squeal when she is being carried outside but she get even louder when you are carrying her in. After I figured out just how much time and work Ms. Buttercup was taking away from Mom’s day I decided to help her out a bit. I made her a Simple but better halter. It didn’t take me long and knowing Mom’s plan to not use a halter at all I knew it didn’t have to be much. 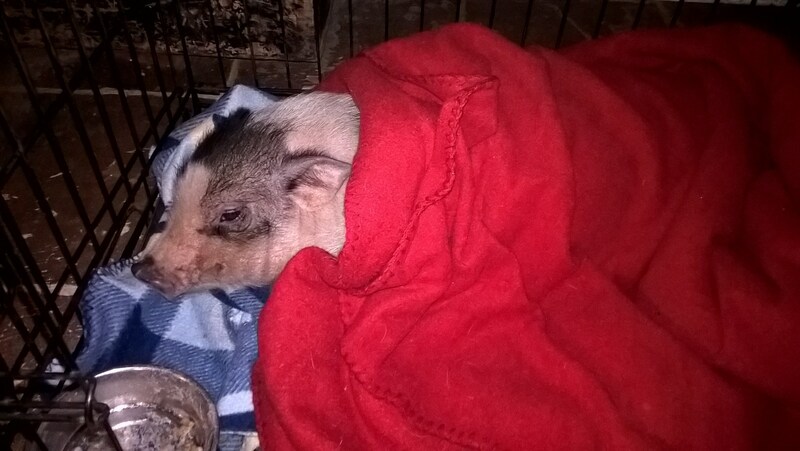 So I whipped one up that slips over Buttercup’s head and the wraps around her belly with little effort. And the leash is built in. It actually works better then the other halter. However, it still isn’t a piece of cake with Buttercup. She is still learning what we expect of her so there is still squealing but she isn’t fighting us as much and she is walking better each time we take her out. 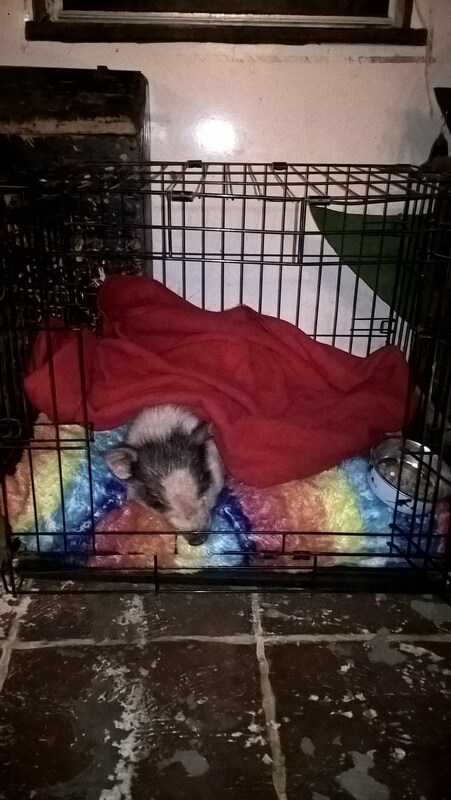 I have to say that for once I really hope that Mom can get a handle on Buttercup and get her going in and out with little effort. Right now I am going to head to a team roping. Dad did chores so mom should have an evening to herself … I think she is going to be doing a bit of spinning. Today was interesting… Okay a bit more interesting for Mom then Me. I got up and went to work like normal. 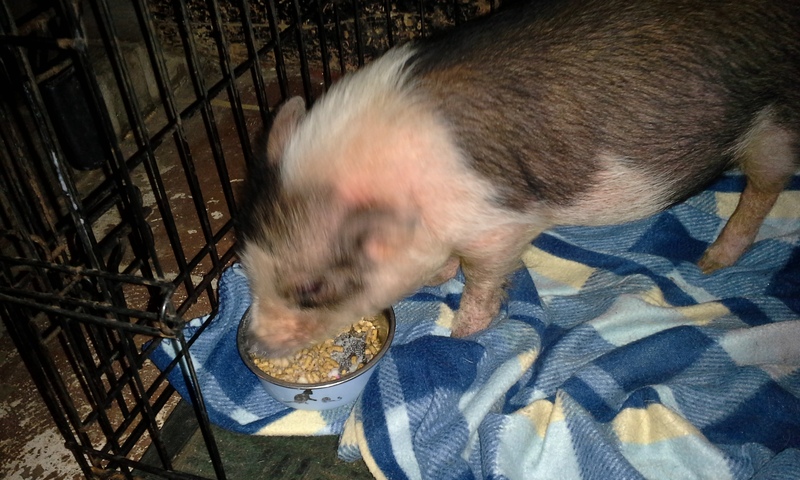 Mom had the Pig to get used to the dogs and the dogs to get used to the pig along with all her daily chores and tasks. Then add to that two calves escaping, a bit of fence fixing and a load of feed to get and you have her day. So it all started after her morning chores got started. She had to get two calves that got out of the fence back into our pasture. After that she headed to the pasture to make sure all the others were still in the pasture and safe. It turns out they were. Then Mom took a bit of time to get the two calves into the equipment pen so they wouldn’t hurt the lambs. She then turned her attention to the dogs and Buttercup. The big issue is that Buttercup doesn’t like her halter. And when I mean doesn’t like it I mean she gets down right loud and squirmish any and every time you try to put it on her. Therefore Mom spent more time trying to get it on her then she did taking her out to potty. Our plan is to have her trained to go in and out with the dogs and to get rid of the need for her potty box. The issue is that she won’t leave the house unless Mom carries her or forces her to on her halter. She has also figured out how to slip out of her halter … LOL Needless to say Mom had her hands full. By the time I got home she had the dogs and pig under control. That means it was time to go get feed. We also picked up t-posts to fix the fence. We also grabbed a bit to eat and stopped off to get a few things in town. When we got home Mom and I had to go fix the fence. It was challenging because we couldn’t fix it from inside the fence as the pasture was to wet. With all the rain we have had the truck would have gotten stuck. So that means we had to do it the hard way. We loaded the truck and headed down the road. We then parked on the side of the road and trekked across the ditch and right away to fix it. While we were fixing fence the neighbors dog made his way over to the sheep and cattle pastures. Hank and Jethro took time out of their busy day to chase it off again. That dog is getting on my last nerve. It better start staying away from our place. Next time I am going to have to take action and scare the daylights out of him. Anyway, we got it done just in time to get dinner going. Mom fixed dinner while Dad and I gathered eggs, hayed and watered everything. Then After dinner it was time for chores and the nightly routine before bed. So that is what I am doing now … Heading off to bed that is. So today was a long one. The rains started last night and the storms dropped a ton of rain as waves of storms came through. We were out Moving goats and sheep to get them dry land and shelter at Midnight or later I am not sure exactly what time it was but it was late… Or early. Either way it was dark and my sleeping time. It made for a late start. So last night the Rain started coming down in sheets about 10pm. There were periods of Hail, Thunder and Lightening. The Electric kept going out but never really took long to come back on. I went on to bed while Mom kept watch. Sometime around Midnight Mom came and got me up to Help her get the goats to dry land. We ended up moving them into the barn as their pen was ankle high in water everywhere. That means that the babies and the nannies didn’t get split so Milking the next morning would be short. That is okay though because at least they were all dry and healthy. We had to open gates to let rainwater through them all. While we got things draining we had to get a few of the baby sheep off the pasture and under the shed. The water was around the shed cutting the pasture off from the shed and leaving no dry way to the shed. It only took us a couple of minutes to scoop the babies up and get them to the dry shed and their Mommas quickly followed. Thanks to the electric going out at different times Dad’s alarm didn’t go off and he had just 10 minutes to get ready and out the door for work so he wouldn’t be late. Mom got up and while he got dressed she packed his lunch. Then she went back off to bed since she had only gotten a few hours sleep. That means no one got me up on time and my alarm didn’t go off right either. Good thing Kevin Understands. When Mom and I went to do chores we found hundreds of Seagulls had found their way to our sheep pasture. They were cool to see but man do they make an awful noise. Anyway, I helped Mom with chores before turning the goats back out to their pen. Only hours after the rains had stopped most of the extra water had rolled on off the pasture and made some dry spots around the land and in the stalls. I headed to Kevin’s to get his chores done as he is at a show this week. Mom warmed up the house by getting a fire going and then she said she did some computer work learning how to tag videos on Youtube as well as working on her Fiber study and some new videos. When I got home I chopped some more fire wood and did really do much. Mom had her other buddy after school today and they ate popcorn and watched a couple of Movies. 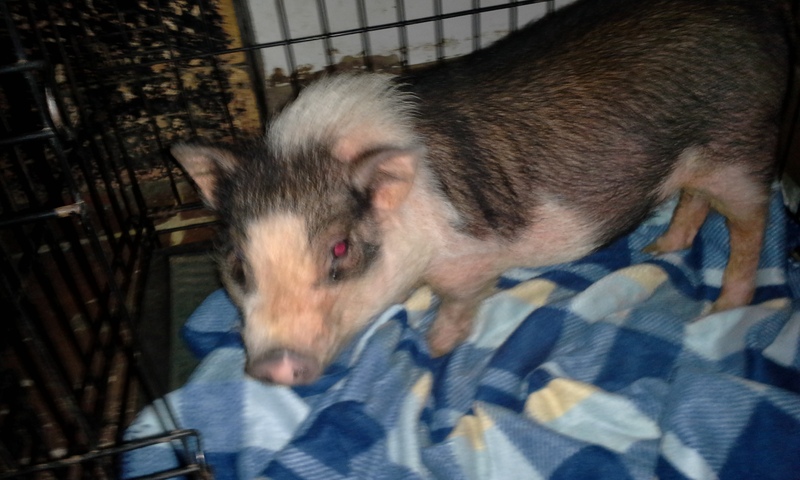 During these Movies Mom took a call about a 6 month old Pot bellied Pig. It was at a Dog Foster home for a Rescue and it needed a forever home. So Mom said “sure bring it here”. 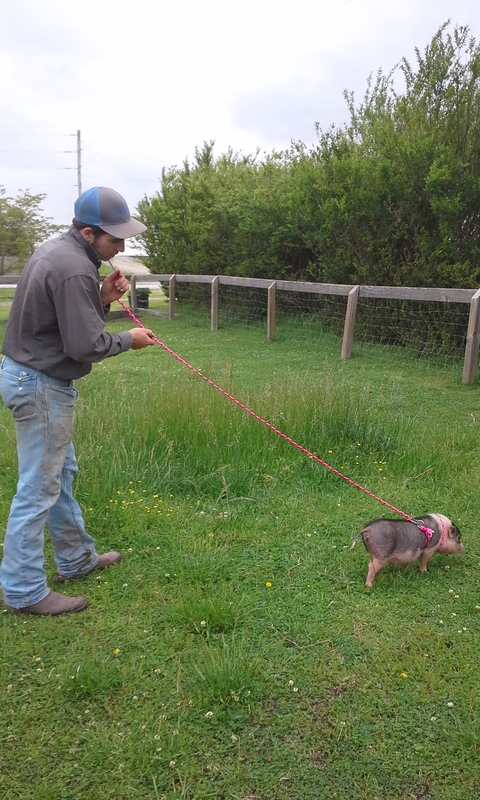 What is funny is that Mom has had pigs before and she never wanted to get rid of them but she did to give me the pen for the goats. She had been telling Dad and I that she wanted to get one again and Dad and I have both been saying No. Well, God worked it out in Mom’s favor. So today RJ went off to work and I slept in. After his long weekend roping I really needed the sleep. When I did wake up, I found a text that said my Buddy needed a babysitter. Or as he says he needed to come help me … LOL So I hurried and got the milking done as that is the only chore that he isn’t really good at as he likes to try and feed the goats cookies while I milk and that ends up with him spooking them because he is to short to reach their mouths. Anyway, after he got here we set out and finished up the rest of the chores before feeding Leighton. Who by the way we have been calling Leah. Nothing like getting two goats names mixed up huh?? After that my Buddy has his favorite routine … He eats then turns on Bloopers as he calls it and plays bucking bulls. Well, today I put a kink in his routine. Lucky for me my changes in his plan took us by the local donut shop and that fixed everything. I just had to make a run to town as I needed to drop off some things with the Community Action Network. They are the ones that got us our grow tower and we are splitting the seeds that I got from Rareseeds.com. Anyway, Grumpy Ol’ Man had to go to the bank too so we all loaded up and hit the road. While I was in the CAN office I talked to Trista about going to the Festival they have at Baker Creek Heirloom Seed. I really want to go but I don’t want to drive the 3 and a half hours by myself. 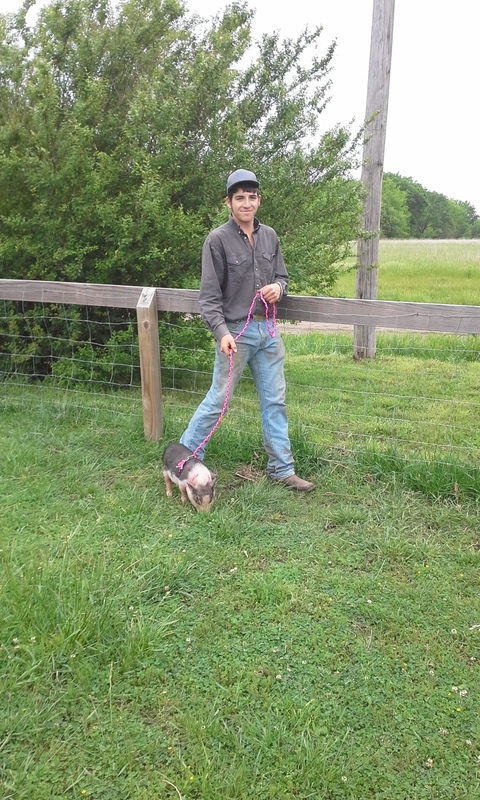 It is on Sunday and Monday and Sunday I have to watch our farm as RJ is roping. Monday RJ has to work half the day but can be home by 10 or so if he needs to be and Dad is off that day as well. So If I get to go it would be on Monday but alone. So I asked Trista if it would count as work for her and if she would want to go. She said we might just be able to work it out so I am praying that we get to go. Only time will tell. It was all down hill from there. Gathering eggs, a found turkey feather for his hat and helping run the chutes for RJ in the roping pen kept him pretty busy. He wouldn’t even come help me use that new soil Blocker to plant any seeds. At the end of the day he was one pooped little Buddy but he also had a blast. To top it off he kept asking me “You know what I miss?” and when I would reply “Nope, what? He would simply answer … “You”. I so love my little buddy and do miss having him everyday but on the other hand … I have so much going on!!! I guess I will just have to treasure the days that I manage to fit him in as his back up babysitter! So today I had the day off because we were suppose to have people coming but they cancelled last night. 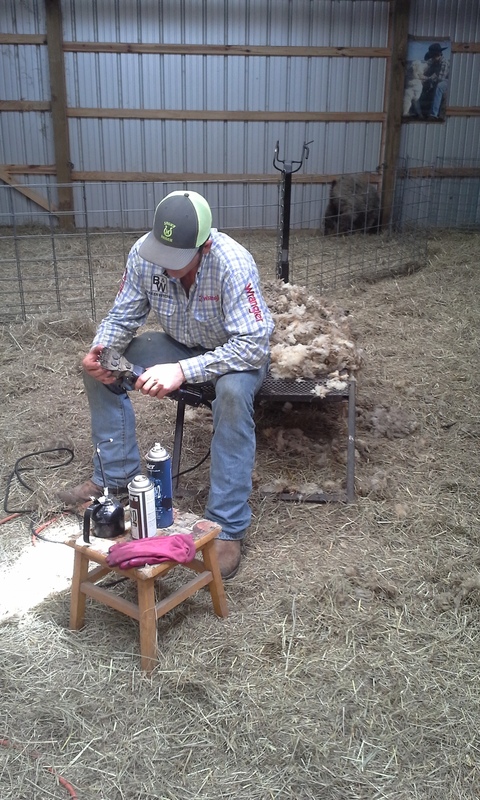 So I got to catch up on some sleep and get in a bit of shearing. The only real issue was the Rain … Oh and yes .. the rain … and yup more rain. We are in the rainy season here. It happens every year and every year we try to get a handle on controlling the flow so that all the stalls stay dry. This year really isn’t any different. So I slept in until 9am. Then Mom and I headed out to get chores done and assess the flooding. This year all the animals has at least a dry stall to get up under during the rain. Mom isn’t really happy with the sheep stall as she wants it to be built up a bit more and we are going to try and move the flow of rain a bit further out of this summer. However, for the most part we are happy with how the water flows around the new barn. We know we can’t have a perfect world but if that sheep stall was built up a bit more we could live with knowing it is the best we can make it. When Mom and I came in we ate a breakfast of Omelets and bacon before we decided to take us a nap and catch up on a bit of sleep before setting out to get today’s shearing done. When we got to the barn Mom found another issue she had to take care of quickly or there might have been tragic results. You see yesterday it was about 85 degrees making the barn kind of hot. Then today the barn was all of about 55 degrees due to the temperature drop outside. That means our chicks had to do a bit of fast adjusting. Well, we didn’t adjust the light so they chicks were to cold. So cold that one of the smaller chicks passed from being laid on by the others. So Mom grabbed a heating bulb and put it back in the light for them. Then she covered the rocks under the light with a layer of hay. This created a nice warm spot of them all. She also added a tub with food and water and it’s own light for a few weaker chicks. Once they got stronger she put them back in the big pen. All but two had rejoined the flock by the end of the day. One that was almost lifeless and the other had a hurt leg from being laid on. All in all I think she got it under control. 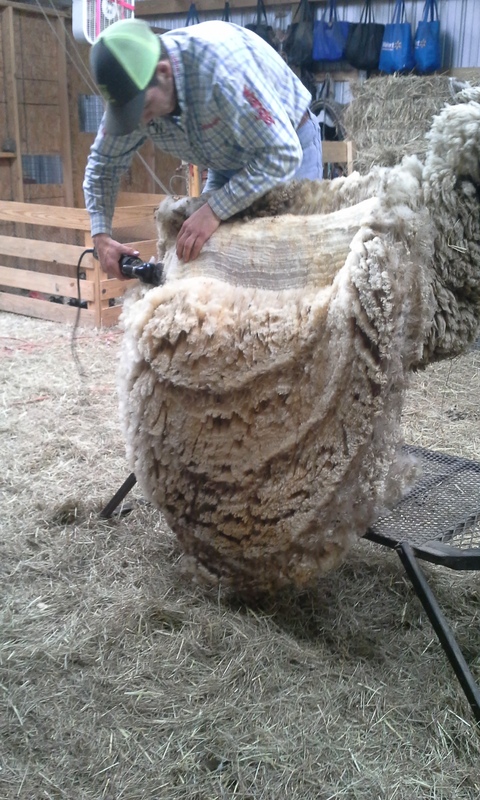 After that we got to shearing. As of right now all the Goats are done! Little Sienna just got her fleece cleaned up a bit as she was sick with fever not to long ago and she had a fiber break. Look at Cisco Kid’s Horns … Aren’t they getting so big and beautiful?? After shearing we ate chili Mom had made in the crock pot for our cancelled guests. Then we did the evening chores and now I plan to get some more sleep because I have to be up early to head out to a roping. So today We were kind of on the busy side. There was Easter Dinner Preparing, Calf Delivery and Pick up, Shearing, working and Meetings. Add in some rain and a nice family meal and you pretty much have our day. And it was a long one. Mom and I started out doing chores. Then after the milking, bottle feeding, feed and watering … you know all the normal stuff … We had to deliver Cosmo to his new home. On the road we got a call about a calf that needed a ride to a different home and we were asked if we could bring it to our house and it could be picked up from there. While we were doing this big calf juggle Mom took time to drop off two forms for possible interns this summer. We are praying Bella will return to us and there is one other that we know is interested. This year the plan is to allow Three interns to volunteer here this summer but we will see. In between fixing our meal Mom took time to publish the Intern page with the form and a few more details to the web page. 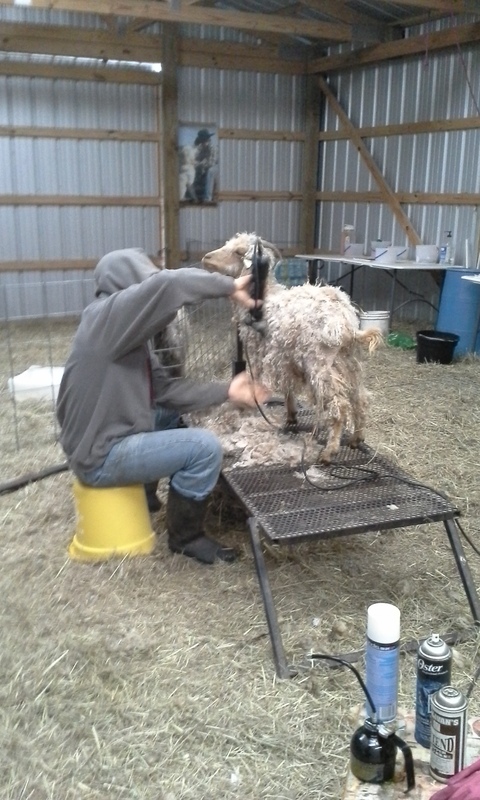 When we got home Mom and I took time to get the three sheep sheared that I put up with the goats for Tomorrow. Patch, Melody and Gigi are now done. After that I had just enough time to ride my outside horse while Mom started fixing the rest of our meal. You see, tonight my Sister and her Boyfriend came over and we all had our Easter meal together. (They had to work on Easter so we postponed it) After the Meal I left to go to work and Mom left to go to a meeting for the Farmer’s Market. A little bit after Mom got home from her meeting she got a text. The people that were suppose to be coming tomorrow to learn about Angora Goats said that they wouldn’t be coming because it was suppose to rain and they wanted us to postpone the goat shearing until next Wednesday. I really don’t think people take into account that it takes time to get things ready. 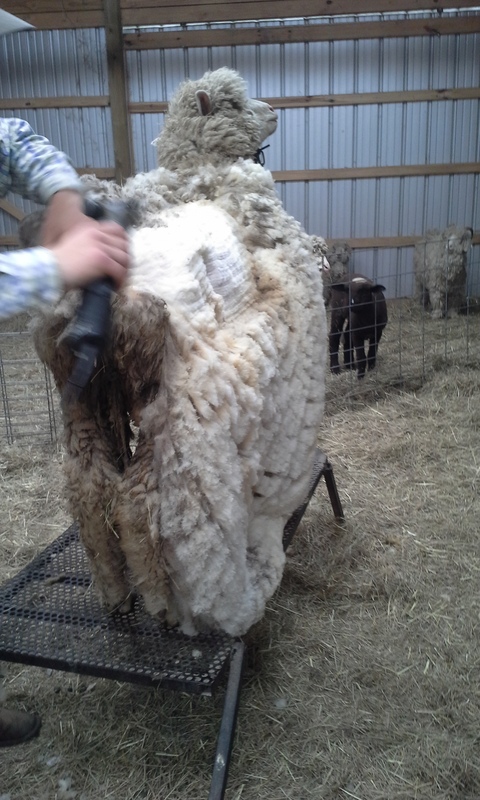 It takes time to make sure the animals are dry and ready to shear. It takes time to set everything up. It takes time to get everything we use gathered and where we need it. Also I don’t think that they think we have anything better to with all that time. I took off from Kevin’s so we wouldn’t feel rushed and we would have plenty of time to answer their questions. Mom turned away other group farm visits as well so that both the couple and the group had our full attention. Not to mention the fact that we do it all either free or as cheap as possible. 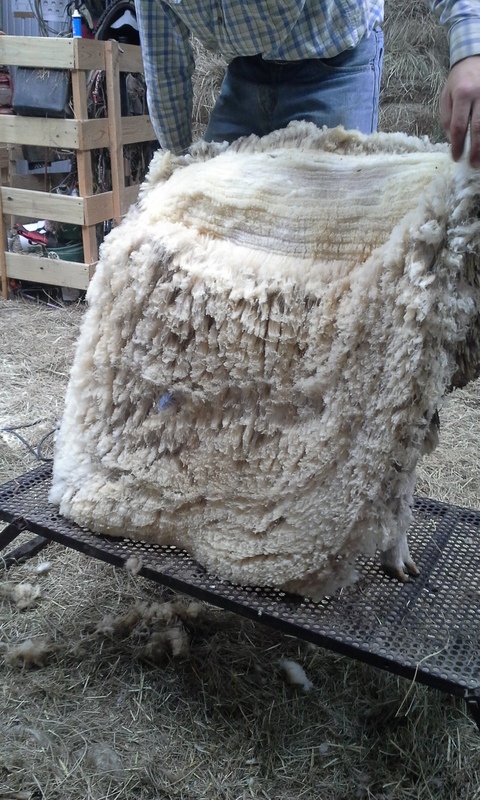 In this case we had to shear anyway, so we were going to do it for free as long as they helped out. Now all that time has been wasted and this couple thinks it is okay to stress the goats and then cancel only to stress them again and shear another day??? No it isn’t okay to do that to them. Therefore we have another activity on the farm that is on the list of things that require a deposit. Group Visits were already on it but now we have added all workshops to that list. And one of the biggest reasons being is that these people are allowed to pick the time and day to accommodate their schedule. We are the ones that do all the work and change our schedules to accommodate them only to have them cancel with less then 12 hour until they were due to arrive and wanted us to change it all? Well, we are not going to move it. 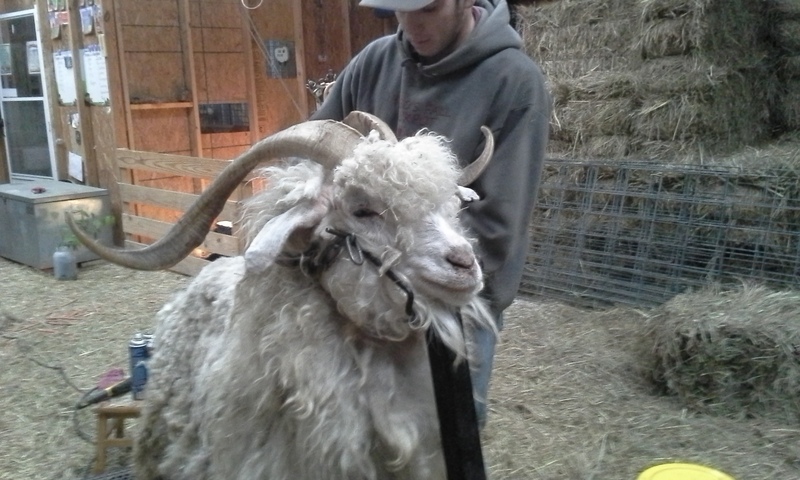 Tomorrow Mom and I will be shearing All the goats. Normally, we split it into two days but we have had them stressed enough by penning them BEFORE the rain last night so they would be able to be sheared. They have remained penned in the barn all day and will be in there until tomorrow when they are sheared. Anyway, enough about that. I am sure you get the picture. 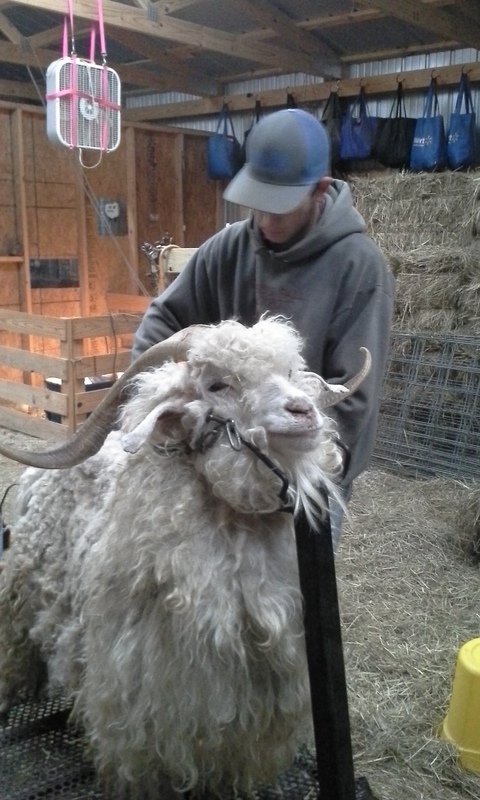 I am off to bed so that we can get up and get the shearing done.